Deep cycle batteries deliver a great deal of power for a long period of time, and they come in relatively small containers. When you have that much power in one small area, there are going to be safety concerns to worry about. If you handle deep cycle injuries for your company or even at home, then you need to be aware of these types of common injuries that can occur at any moment. These batteries generate their power by using a series of toxic materials that can be extremely harmful if ingested or inhaled. When you are working with deep cycle batteries, it is extremely important to avoid direct contact with the chemicals inside, and even more important to take immediate action if the chemicals are ingested or inhaled. The charging process for these batteries creates a series of gases that are extremely flammable. A common and devastating type of injury that happens when handling deep cycle batteries occurs when a spark or electrical current makes contact with these gases and causes the battery to explode. This is a very real concern that everyone who handles these batteries should be aware of at all times. Another very common injury with deep cycle batteries are burns that come from wearing low-hanging jewelry. The jewelry could make contact with a terminal on the battery, and then complete the arc with another piece of metal. If that happens, then a shock will go through the jewelry and cause serious injury. The ideal way to avoid injuries is to set aside an area that is designated only for working on batteries. This area would be well-ventilated, have a fully-stocked first aid kit on hand, have neutralizing solution nearby, not have any low wires or anything that could cause a spark, and have a work table that is the right height to work safely on batteries. At Industrial Powersource (IPS), we offer complete safety training on handling and charging deep cycle batteries. Our experts will walk you through the entire process and give you all of the professional advice you will need to keep your work area safe, and avoid the common injuries that can occur when using these powerful batteries. According to OSHA, industrial forklift batteries should last approximately 2000 discharge/charge cycles or 2000 work shifts (under normal conditions). However, frequently transporting heavier loads will drain forklift batteries more quickly than moving light objects. All batteries need sulfuric acid to work properly. Sulfuric acid is extremely corrosive and can cause all degrees of burns if splashed on skin. When you are replacing forklift batteries, always wear protective gear made to resist sulfuric acid (OSHA approved face shields, chemical aprons and rubber gloves). Remove jewelry and all nearby metal objects from the area before replacing forklift batteries. Metallic objects can short circuit battery terminals and cause an explosion or arc. Double check that the forklift is aligned with the hoist before lifting out the battery. You don’t want a hoisted battery swinging even slightly as you remove it. Also, make sure hooks are firmly secured in the battery’s lifting holes. Inspect vent captions to make sure they are working. Compartment/battery covers need to be open to allow heat to dissipate. Make sure ampere hour ratings are no more than 10 percent of the forklift battery being charged. The battery’s model number tells you the number of cells, amps per cell and plates. To find the ampere hour rating, subtract one from the plate number and divide that number by two. Then multiply that number by the middle number. That should give you the ampere hour rating. Never water forklift batteries prior to charging them. Overfilled batteries will spill over while charging, allowing dangerous sulfuric acid to erode floors and possibly cause accidental burns. Also, water forklift batteries only with de-ionized or distilled water. Make sure the plates are covered inside the battery cells. Keep looking for gas bubbles while recharging forklift batteries. The sight of gas bubbles means the battery is almost fully charged. Resulting from the positive plate producing oxygen and the negative place producing hydrogen, bubbling is necessary for creating consistent acid levels across all plate areas. Forklift batteries that are too hot or too cold won’t charge correctly. NEVER charge a frozen battery and NEVER charge batteries hotter than 115°F. Replacing and recharging forklift batteries should only be done by people with the experience and knowledge necessary to perform this action correctly. Staffed by skilled personnel who can replace and recharge all your forklift batteries, Industrial Powersource ensures optimal functioning of your forklift batteries so don’t need to worry about unexpected operational delays or serious accidents. Contact IPS Battery today for more information about our extensive line of services and products. Industrial Powersource has been offering a battery rental service for many years now, and we find that it offers tremendous value to our clients. Whenever we get a chance, we always like to point out our rental service to clients who are not utilizing it, just so they know that they have the option. Why would you ever need to rent a battery? When we get this question, we offer answers that deal with short and long-term issues. The flexibility of our rental program is what makes it so popular with our clients, and we would like to see more of our customers take advantage of what the rental program has to offer. Our rental program allows you to have the batteries you need at a fraction of the cost of buying them. If your company is not comfortable buying used batteries, then we would recommend renting them to save on costs and still get the power you need. When we rent out our industrial batteries, we always allow customers the option of renting chargers, racks and material handling equipment as well. Once again, this is a convenient service that gives you all of the power equipment you need at a fraction of the cost of making a full purchase. If your batteries are not properly maintained, then they will start malfunctioning and giving you problems. One of the more common maintenance issues companies have with their industrial batteries is improper watering habits. An industrial battery without water is a battery waiting to burn out. The last thing you need is to find out that one or more of your batteries are dead, and you have no replacements on hand. Instead of forcing yourself to invest in brand new batteries that can take time to get up and running, just call our rental service and we will have batteries to your site quickly that you can use immediately. You will reduce costly downtime, and you will buy yourself the time you need to alter the budget to replace the batteries that were damaged. You brought in a couple of extra forklifts or scissor lifts to do a special inventory project in your warehouse, but the lifts did not come with batteries. This scenario is more common than you may think, and it can create a difficult situation. Do you put that temporary equipment to the side and slow the pace of your inventory, or do you buy new batteries for machines that you will only have for a week or so? The solution is our battery rental service. You can rent batteries to run machines for temporary projects, and you can also use our rental service to offset the costs of buying batteries as your operations grow. With our battery rental service, you can add more machines and put off the costs of buying new batteries until your budget allows for it. The Industrial Powersource battery rental program has been popular with our customers for a long time because it delivers value and quality products. The next time you find yourself needing to replace a burnt out battery or in need of a temporary battery to run new equipment, we recommend you give us a call and use our battery rental service for immediate results. Use Your Year-End Capital Budget This Month and Save Big! Why Choose an H2GO Battery? At IPS, we offer a full range of Crown Batteries, but we sell more H2GO batteries than any other type. Aside from being a quality Crown product, the H2GO battery has some unique features that make it a great value for our customers. When you are looking for forklift batteries or heavy duty batteries that use the latest technology to give you more for your money, then we suggest that you take a look at the H2GO line of Crown batteries. A battery operates using a carefully blended combination of acid and water called electrolyte. As the battery generates energy, the water evaporates and it becomes necessary to add water to the battery over time. If you try to water your battery too much to cut back on watering intervals, then the electrolyte will overflow and possibly corrode your equipment or harm your employees. When you don’t water your batteries enough, the level of acid continues to drop until the battery is permanently damaged. Watering batteries requires removing the cap on each cell and refilling the water to the proper level. Most batteries must be watered every two or three weeks, which can take up a lot of time. The H2GO batteries only need to be watered once every three to six weeks. This allows you and your crew to invest more time in getting work done, and less time in watering your batteries. Your batteries give off a liquid emission that is a combination of the water and acid used to safely generate power. One of the reasons why the H2GO batteries only need to be watered once every nine to 12 weeks is because of their recombinant vent caps. These innovative caps gather the escaping liquid and recombine it in with the electrolyte in each battery cell. It is a safe and effective way to reduce electrolyte loss in your batteries, and give you more battery time. Within each battery cell is a separator material that helps to reduce how much water is evaporated as the battery operates. In the H2GO Crown batteries, there is an advanced separator material that improves each cell’s ability to accept charges, and significantly reduce the amount of water used to generate energy. This is yet another innovative Crown feature in the H2GO line of batteries that saves you time and money. When every part of a battery is designed to maximize electrolyte usage, then you get a battery that lasts longer. The H2GO batteries use a special paste in their skeletal structure that makes better use of the electrolyte inside, and also prevents any liquids from escaping from the battery. With this advanced skeletal structure, your H2GO battery will last longer and require less watering intervals. The H2GO batteries come with a five-year warranty and an LED indicator that takes all of the guess work out of monitoring and replenishing water levels. With all of the advanced features Crown Batteries has put into the H2GO line, it is easy to see why so many of our industrial and commercial clients choose these batteries to operate their forklifts, scissor lifts and any other equipment that requires reliable battery power. Reconstituted heavy-duty batteries are a crucial part of many fields, and doing your own maintenance can extend a battery’s usable life. This can save you time, money, and energy. To perform battery maintenance safely, you must be aware of OSHA guidelines. Additionally, you must take precautions to keep your workers safe in case an industrial battery accident does occur. The Occupational Safety and Health Administration (OSHA) has several specific guidelines regarding reconstituted industrial batteries. The equipment in which these batteries are used, such as electric forklifts, can be dangerous if handled improperly. OSHA requires that workers charge electric forklifts and other equipment fully before using it. Additionally, these heavy lead-acid batteries should be charged in a separate area away from workers. Remember that industrial batteries must be changed frequently; it’s safer not to operate equipment with a draining battery. Once you’ve set aside a charging area, make sure it complies with OSHA rules. A proper charging area should have adequate warning signs posted in several visible areas. It should also have sufficient fire protection and a telephone for emergencies. Your charging area needs neutralization materials for the emission or leakage of dangerous battery components. To go along with this, the charging area should be fully ventilated. Otherwise, hydrogen gas can build up and lead to fatal medical emergencies. Adequate ventilation will also protect the area from fires, but the charging station should have at least one CO2, foam, or dry chemical fire extinguisher. An OSHA-compliant charging station is essential, but the best way to protect yourself is wearing the proper gear while handling batteries. Industrial batteries are heavy and made up of corrosive chemicals that can cause severe burns and other injuries. To protect yourself, you’ll need PPE-approved goggles and a face shield. Always cover your hands with acid-resistant gloves. In particular, verify the gloves’ resistance to sulfuric acid; contact your supplier for information. All of your clothing, including footwear, should be acid-resistant, and you should wear a chemical-resistant apron if you work with batteries frequently. Make sure your footwear is sturdy; opt for work boots or a similar shoe. Acid spills, burns, and electrical accidents can happen no matter how careful you are. If one does occur, ensure your workplace is ready. OSHA requires an eyewash station with a minimum 15-minute flow in the battery charging area. If an acid spill occurs, neutralize it immediately using approved acid neutralizing agents. Ensure the acid has stopped fizzing before attempting to clean up the spill. To be perfectly safe, check the spill’s pH first. For large spills, you may need earth or clay dikes. Rinse spill residue from the battery with a water hose, and remove grime from around the connectors. Report the spill to a supervisor who can contact the proper authorities about safe disposal. IPS provides battery maintenance and safety training as a service to its customers in both the sales and warehouse departments. For more information, contact us today. Industrial Powersource (IPS) is the leader in motive power sales and service for your warehouse operations. We are the fastest growing supplier of Crown forklift batteries and chargers on the West Coast. We provide unparalleled service to our customers and offer the best competitive prices in the industry. Our expert technicians have over 30 years of skilled expertise, who strive to minimize your downtime and provide efficient and dependable service. Our Service department provides battery and charger test & evaluations, battery refurbishment, and custom-made batteries. Our Field Service technicians are fully equipped with an extensive suite of tools and knowledge to ensure uncompromised productivity and service. Water batteries to correct level to prolong battery life. Clean and inspect all batteries and chargers. Detailed, visual inspection of all battery components. Replace misc. watering parts (caps, injectors, hoses). Visit ipsbattery.com today for more information about our products and services. We are ready to serve you with high quality care, affordability and access. Let IPS know how we can be your preferred motive power solution expert. 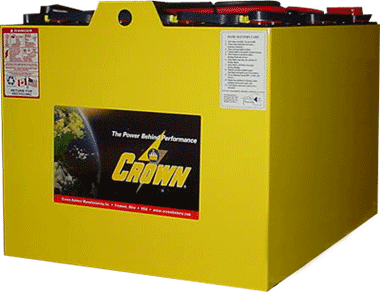 Crown industrial batteries are known for their superior power and performance. Did you know that your battery relies on you just as much as you rely on it? Without proper maintenance and care of your battery, its lifespan may be significantly reduced. If you want to get maximum benefit from your investment in industrial batteries, it’s essential to schedule preventative maintenance. At Industrial Powersource, we’re committed to helping you get the most from your Crown battery. We know that life is busy and it’s easy to lose sight of details. But when it comes to your industrial batteries or commercial batteries, neglecting proper maintenance and care will cost you lost time, money, and productivity. Take a look at some quick and easy ways to ensure your battery receives routine preventative maintenance. Prior to purchasing new industrial batteries, it’s important to discuss your specific needs with an experienced professional. How much time and energy are you able to spend to make sure your battery receives maintenance? What kind of maintenance does your battery require? What will your battery be used for? Can you or your business operate if something happened to your batteries? The answers to these questions will factor in to your battery choice. Once you’ve decided on a battery, talk to your supplier about creating a preventative maintenance schedule. For batteries, a preventative maintenance schedule may include watering intervals, visual inspections, charging intervals, replacement, or repair of parts, and voltage and specific gravity readings. A preventative maintenance schedule can help keep you on track, but it can’t pinpoint when unexpected problems might occur. If you rely upon industrial batteries for your business, it’s important to visually inspect your batteries for wear. Ideally, you should visually inspect your battery’s condition, cables, caps, water levels, and charge it correctly. In order to experience the true longevity of an industrial battery, you must ensure they receive maintenance from experienced battery professionals. Industrial Powersource offers affordable preventative maintenance plans. Batteries require specific and careful care or they will cease to function properly. This results in loss of production time which means less profit. IPS’ highly trained and experienced technicians are the best to service, maintain, and take exceptional care of your equipment so that they stay in top performing condition. IPS knows that batteries are the force behind your productivity, and we are committed to helping you succeed. For more information about Platinum Care, contact us today. The New Year inspires a desire to do better than you ever have before. It’s the time of year when we’re most motivated to increase our productivity, work harder, and work smarter. With the help of Crown batteries, you can supercharge your New Year with the industry’s best industrial batteries. Whether you’re looking for industrial batteries or commercial batteries, Crown makes the right battery for you. Take a look at the top five reasons to ring in the New Year with a Crown battery. Crown is committed to safety, quality, and superior performance. Crown is frequently recognized for manufacturing the industry’s best batteries in a safe and efficient manner. In addition to winning awards for safety, Crown is recognized for creating top notch industrial batteries featuring an in-line solid-cast construction. Known as a top producer of industrial batteries, Crown has a strong commitment to quality. Crown industrial batteries feature thirteen vertical grid wires and are the heaviest in the industrial marketplace. With proper maintenance and care, Crown batteries will exceed performance expectations. Additionally, Crown batteries have deep cycling capabilities and the ability to maximize your battery’s power while maintaining a high level of performance. Crown industrial batteries feature total Posiwrap Protection, making Crown batteries the most insulated batteries on the market – providing unrivaled protection against wear and short circuits. Posiwrap Protection provides your battery with the ability to out-perform the competition. If you’re looking to invest in long-lasting performance and quality, Crown industrial batteries are a good investment. Because of their dedication to excellence and superior performance, Crown manufactures industrial batteries and commercial batteries to hold a superior charge and provide maximum performance. Crown industrial batteries are easily maintained and do not require a special charger. Whether you’re working on a project, powering a business, or need superior industrial power, Crown batteries are a smart choice. Have you ever had a hard time finding the perfect battery to meet your needs? Have you been searching for industrial batteries for your business and can’t find the right one? Crown knows that everyone’s needs are different – that’s why they offer the option to customize a battery to your unique specifications. That’s right – your battery, your way. No more unsuccessful searching while wasting time and money. Crown has the perfect industrial batteries and commercial batteries for your needs. If you’re planning to work harder and smarter in the New Year, Crown batteries will get you there. With Crown industrial and commercial batteries, a range of battery options awaits to help you get the job done. When choosing a Crown battery to supercharge your productivity, make sure to consult with a knowledgeable professional about your specific needs. At Industrial Powersource, we’re committed to helping you succeed in every endeavor. Whether you’re looking for industrial or commercial batteries, Industrial Powersource is here to make the process simple from start to finish. Contact us today for more information about Crown batteries. If you are in an industry where forklift batteries play a prominent role, you already know that a new forklift battery is a major investment. You also probably know that, from time to time, you will need to purchase new forklift batteries for your equipment. What many people do not realize is that there are a few simple ways to prolong and extend the life of their existing lead-acid fork lift batteries. If you use lead-acid forklift batteries in your business and need tips for maximizing their lifespan, read on for advice from the pros! Formatting: Formatting refers to the stage where a brand new forklift battery is “broken in.” On average, it takes between 20 and 50 full cycle uses for your batteries to begin to run at full capacity. You do not need to do anything special in the formatting stage, just use the fork lift battery in the field as you normally would. Peak: After formatting, your forklift batteries will run for anywhere from 100-200 cycles at peak capacity. Gradual Decline: Due to the breakdown of natural materials in batteries, after a certain amount of use, your battery will begin to gradually decline. It is during this gradual decline phase that many users look for new ways to get more life out of their forklift batteries. Generally speaking, there is no perfect way to extend the life of your forklift batteries. As is true with any style of forklift battery, eventually, you will need to replace it. However, during the gradual decline phase of your batteries, there are a few things that you can do to extend the usable life of your forklift battery. During the gradual decline phase of your forklift batteries, begin charging them more often. You will also want to ensure that each charge is a lengthy one. We recommend charging your batteries for 14-16 hours, although you should always check the manufacturer’s guidelines. Another way to prolong the life of your forklift battery is to avoid “deep discharges.” This means that you should try to avoid allowing your batteries to become completely drained. Only operate your fork lift batteries at moderate temperatures if you are interested in prolonging their lives. This is because operating forklift batteries at extreme temperatures will accelerate the natural depletion of the materials. If you are in an industry that uses forklift batteries, you already know that industrial forklift batteries are a major investment. For that reason, you certainly want to prolong their lives as long as possible. 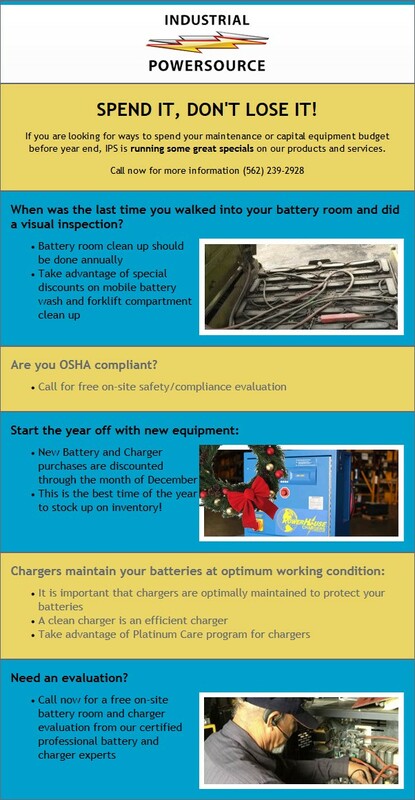 If you use lead-acid fork lift batteries and follow these tips, you will find that your batteries last longer. Have you already tried these tips and tricks and aren’t seeing any improvements, it might be time to have Industrial Powersource inspect your batteries. Contact Industrial Powersource today at 562-239-2928.